The face of the Fr. 186d (W-4496). 1863 $1,000 Legal Tender Note. Choice About New 58. Hover to zoom. 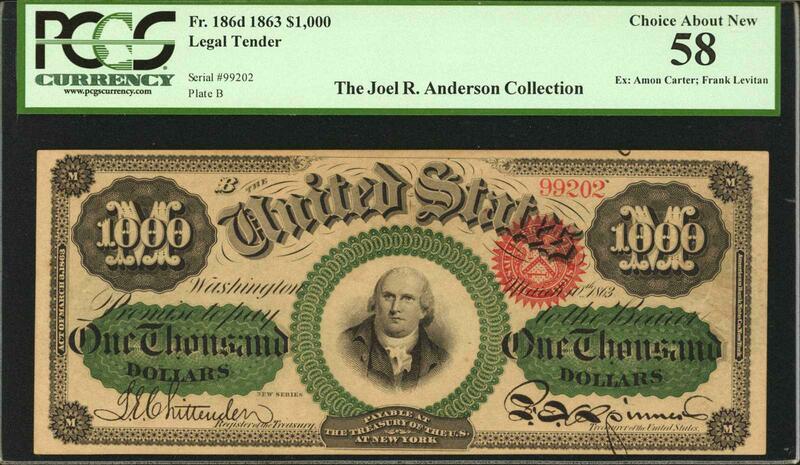 During the Stack’s Bowers auction of the Joel R. Anderson Collection, a rare 1863 $1,000 bill sold for $960,000, one of only two known to be owned privately. …Only four bills in total of the 1862 and 1863-dated $1000 Legal Tender Notes are known to collectors. According to the U.S. Treasury Department, thousand-dollar bills haven’t been printed in the U.S. since 1945. The back of the note. Click here to read the full story from CBS Baltimore.